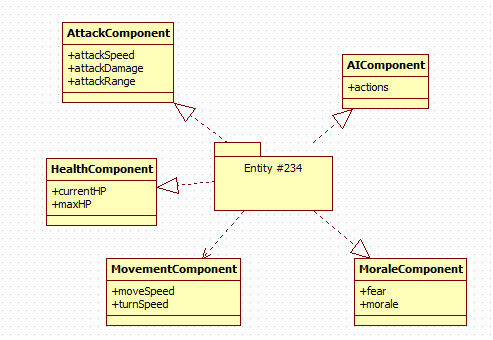 An Entity System (ES) is another way of managing all of your entities in a game, specifically how to organize their attributes (speed, damage, hit points, goopiness, etc...). Attack of the Gelatinous Blob uses an ES and in this post I will go into detail how an ES works and the benefits of using one. The really messy part comes when you are accessing these attributes. Suddenly to see if something can jump we need to know if it is either a Human, or an ArmoredRobot(that subclasses Tank), and then get its jumpHeight. Imagine if there were more types of robots, some that couldn't jump or had some other attributes. 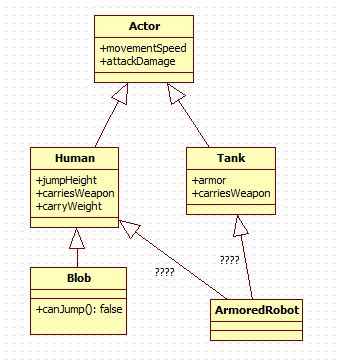 Suddenly whenever we want to use these attributes we have to perform lots of checks and object casting and always have to be aware of the entire Actor class tree; when all we care about is if it can jump! First we create an entity, it is given ID# 234. That's all it is! Just a number and absolutely nothing else. Not all systems run every frame from the game's main update loop, as the combat system does. Some just run occasionally or are triggered to run. So what is the classification of a system? Anything that uses Components. Usually asking the ES for a bunch of entities with specific components it cares about. You do not want to subclass a component. For example with the AttackComponent you do not want a PunchComponent that subclasses it. If you do that, then you are back to checking in the systems "if this is a regular AttackComponent, or a punch this time?" You want to have a separate component, called PunchComponent, that does not subclass. You can then have a punch system that deals with it. This can cause a little bit of duplication of code, but you can use some good design to make sure you aren't duplicating too much. It takes practice, and I had to rewrite the ES twice because I didn't get OOP out of my head when making the first components. -Modability is super easy with components. A mod can just be a system that updates every frame, checks for a HealthComponent and a BlobComponent, and gives those blobs extra hit points every frame, thus regenerating them. None of the other systems have to care about this new system so the risk of breaking things is small. I've also set up AotGB so you can easily add and remove systems. If there is a level where there is no combat (just sneaking around and collecting items instead) I only have to remove or disable the combat system. No side effects; combat just doesn't happen. And all of this with just one line of code! It does take some practice to get used to ES, especially to not think about OOP as you are building the components. It can also be a little too much for a tiny game; if you don't have an existing ES to plug in and use. I wouldn't recommend it to beginners. if you are doing a lot of class casting or type checking: "is this a jumping orc or a swimming orc". And be sure to follow us on Twitter and Facebook for frequent updates and dev topics. Entity systems are practically becoming mainstream around those parts, so there's a lot of experience and second opinions to draw upon. The links in the best practices section of the Jmonkey site are great too. Thanks for all that. I too like this more than the inharitance style of OOP for these tasks. The UnrealScript classes of UDK are the best example hoe that can go wrong. However I wonder why you say this isn't OO design. My understanding of design patterns is very limited at this point but isn't this basically the Decorator pattern? I'm reading a book on DP and the writer strongly argues that relying primarily on (I don't know the correct English term) implementation inharitance is actually often against the goals of OOP (modularity and reuseability). So that one should inharitance to give classes the same interface in the first place and use the best pattern for implementing the functionality. The Components aren't, and should not be, OO in design. The systems however absolutely should be. The components are really just attributes, collections of primitive or maybe complex variables. The author of your book is correct in saying that using only inheritance in OOP will make things difficult. And using an ES will help steer you in that safer direction. A component should be really simple, and something that you can back by a database table or serialize easily over the network. Just be some getters() and setters() with no real operations in them; that's what the systems are for. And in a system you want to limit how many times you check "is this really an AttackComponent, or is it a subclass of it and do I need to handle that slightly differently?" A decorator pattern needs a bit of work up-front by the class to know that it will be decorated. In ES the entity has no knowledge what any of its components are, it is just a happy little ID floating out there. Thanks! Really cleared up what I got wrong, I will read the rest of the links though. I think I'll use JME3 for a game. The community is great and always fast to help with any issues that come up.